getting to the military base and family fun. Located off Interstate 410 West Exit 8 this stylish hotel is about 5 miles from Lackland Air Force Base and SeaWorld San Antonio. Our hotel is just 15 miles from San Antonio International Airport. Entertainment venues including The Main Event are within walking distance of the hotel and the drive is quick to the historic downtown. Consider hosting a San Antonio reunion in our 700 sq. ft. meeting room offering enough space for 50 people. 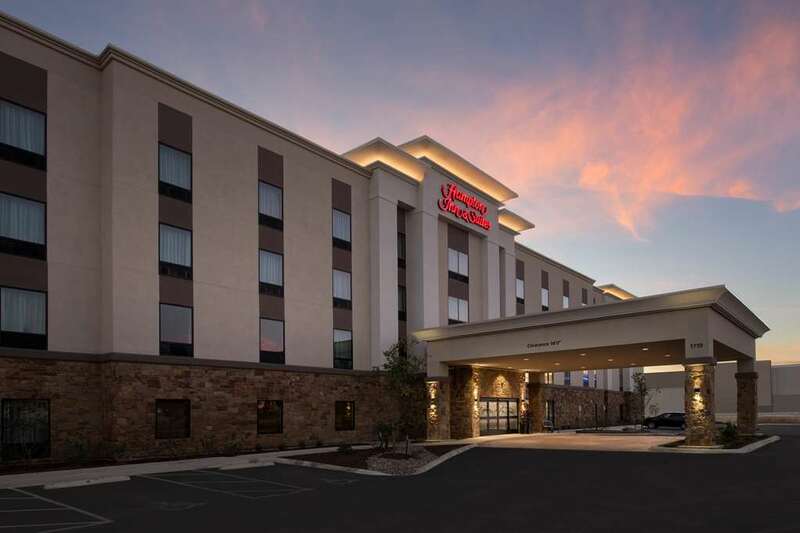 Enjoy free parking WiFi and much more such as access to the heated indoor pool 24-hour fitness center with the latest cardio equipment and use of the 24-hour business center. Ask our friendly team for tips on great lunch and dinner spots nearby while filling up on our free hot breakfast. The Treats Shop has snacks and we keep coffee and tea fresh throughout the day in the lobby. Our guest rooms include ergonomic chairs HDTVs with cable microwaves and mini-fridges. You*ll find all that plus a sofa bed wet bar and separate spaces to work and rest in our suites. Accessible rooms offer roll-in showers or a tub and visual alarms based on availability. All of the accommodations at Hampton Inn - Suites San Antonio Lackland AFB feature our comfortable clean and fresh Hampton bed.